LEXINGTON, Ky. (Jan. 5, 2011) − University Press of Kentucky (UPK) author Albert W.A. 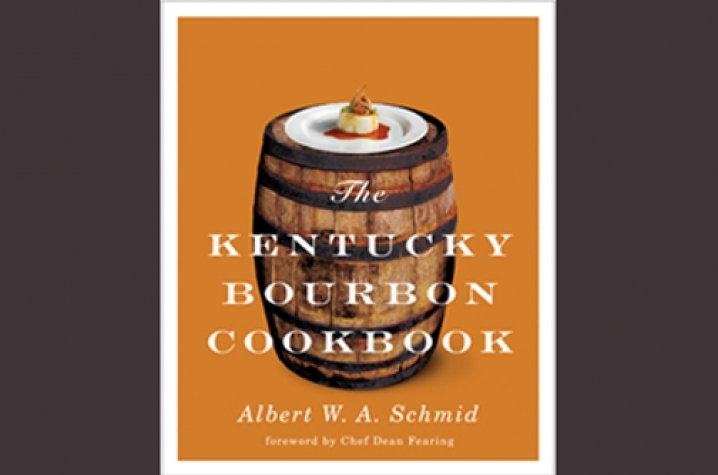 Schmid was named the winner of the prestigious Gourmand World Cookbook Award for the United States in the category of cooking with beer, wine or spirits for "The Kentucky Bourbon Cookbook." The Gourmand World Cookbook Awards, founded by Edouard Cointreau in 1995, honor those who "cook with words" and are the most prestigious international cookbook awards. An overall winner in each category will be selected from the country winners at the awards ceremony scheduled for March 2, 2011, at the theatre at Le Centquatre in Paris, where the Paris Cookbook Fair will begin the next day. A beverage distilled almost exclusively in Kentucky, bourbon has attained prominence and appreciation for its complexity, history and tradition. In "The Kentucky Bourbon Cookbook," Schmid provides readers with the best recipes using the famous spirit of the Bluegrass. From classic Kentucky cocktails such as the Mint Julep, to bourbon inspired desserts, such as Bourbon-Pecan Crème Brulée with Chocolate Sauce, and more savory fare, such as Steaks with Bourbon Ginger Sauce, this book supplies recipes for every course. Schmid uses the four distinct seasons of the Bluegrass State to guide the reader through this collection of bourbon dishes and color photographs. In many ways a lesson on the flavor profiles that pair with and improve the flavor of bourbon, this book can be used by the home cook and the professional chef alike for inspiration to create new dishes. Much more than just a cookbook, "The Kentucky Bourbon Cookbook" recounts bourbon lore, food traditions and Kentucky history, giving the reader a full appreciation of America’s native spirit. Author Albert W.A. Schmid has worked as an executive chef and currently teaches at Sullivan University’s National Center for Hospitality Studies. He lives in Louisville, Ky., and is the author of "The Hospitality Manager’s Guide to Wines, Beers and Spirits," which is now in its second edition. Offices for the administrative, editorial, production and marketing departments of UPK are found at the University of Kentucky, which provides financial support toward the operating expenses of the publishing operation. For more information on this book or for purchase information, visit UPK online at www.kentuckypress.com/.